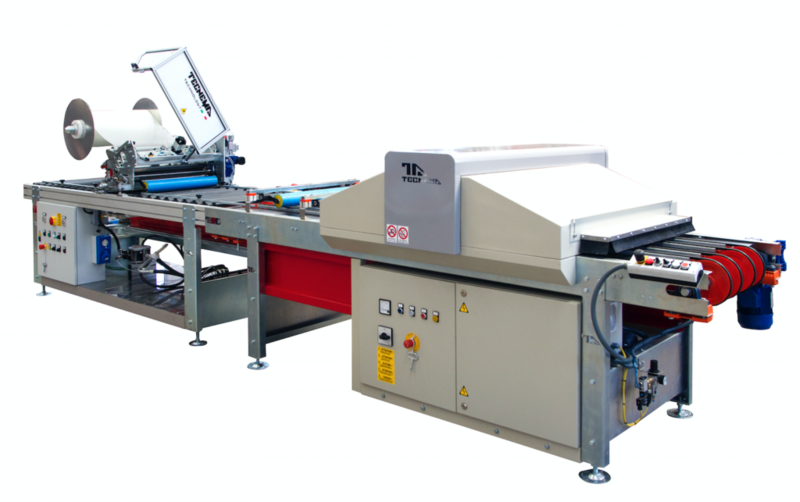 Tecnema Breton Group specializes in advanced standardized machinery as well as designing custom machines and systems to trim ceramic, stone and glass, including bullnose, mosaic mounting and polishing machines. Established in 1989, TECNEMA TECHNOLOGY has become one of the leading producers and innovators in the ceramic industry for cutting and finishing mosaic production. A machine designed for obtaining half-bullnoses, round bullnoses and beveled edges, suitable for ceramics, porcelain stoneware, marble and granite of any size; ideal for producing skirting tiles, 45° steps, bullnose pieces, and bases. Recommended both for small as well as high production rates of porcelain stoneware, natural granite, single- ring and marble with matt or gloss finishing of the profile. Semi-automatic gluing machine working with single component resin on fiberglass mesh and other supports suitable for gluing marble, ceramics, and stones. The drying machine works with RADIATION UV, with selected wavelength, created thanks to a special reflector design and ultraviolet lamp to cure UV/3 mono-component adhesive ceramic, photo sensible, with high adhesion and no water absorption, suitable for ventilated façades and for any type of material.